A house without a dog is not a home. This is Chelsea's Page. I wanted to put this together so that her memory will never fade from my life. It's a chance to share some of her life with others. Chelsea came into my life in October 1995 as the most adorable puppy you ever saw. I immediately fell in love with her. She used to tear around the house like a mad thing, knocking stuff over and crashing headlong into furniture and generally just being a puppy! Her needle-like teeth found their way into just about everything as she started chewing so we gave her the usual doggy toys to bite on in a vain attempt to save the furniture, but she still chewed! She developed a taste for leather shoes and managed to ruin every pair of nice shoes and boots my girlfriend owned at the time. What made me smile (when my girlfriend wasn't looking, of course) was that although Chelsea had destroyed just about every pair of shoes she owned, my scruffy old trainers were never touched! Chelsea grew so fast in the first few weeks and by Christmas she had already lost her squat puppydog features and looked like a true German Shepherd in miniature. She still had the dark coat, but it was already starting to change with some tan creeping into the predominant black. In January it snowed and for Chelsea this was a new experience that she soon found great fun. It took her a while to figure out that the mouthfuls of that white powder kept melting and she couldn't eat it! 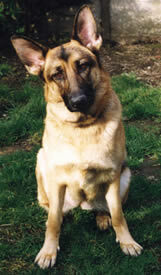 Time marched on and Chelsea grew to full size and was just the most beautiful dog. In that time her chewing got worse before it got better and she managed to totally destroy our three piece suite! We waited until she got out of that habit before we bothered buying a new one! Her only downside was that she was a bit hyperactive and not great with children. It wasn't so much a temperment fault, but that she was so boisterous that when my sisters kids came round Chelsea would run round the room crashing into the boys and knocking them flying! 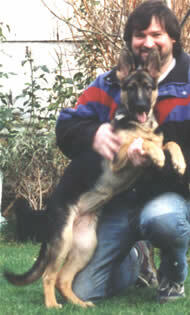 It was that overactive nature that led to the painful decision to have Chelsea spayed rather than risk her having puppies that might turn out as hyper (or worse) than her, than going to homes where the owners might not be so tolerant. We'd heard some horror stories of bad owners beating their dogs for that kind of behaviour, we decided it wasn't worth taking that chance. Spaying actually calmed Chelsea down a bit. The vet told us that it was the kindest thing to do if she was not going to be allowed to have pups herself, because girl dogs were prone to developing problems if they didn't have any litters but remained fertile. Well, life went on and Chelsea had the best of them. She was lucky in that I had already quit my 9 to 5 job and was working from home when she came along, so she never had to spend day after day alone in the house. I was almost always with her, so you can imagine how attached we were to each other. We'd go for walks every morning over to the new golf course and she'd find several golf balls in the undergrowth - I ended up with an incredible collection of the damn things as she'd play with them for a few minutes then get bored and leave them all over the house! As the years went by, I decided that the UK was not a place I wanted to be any more - the financial burden was becoming too great and problems were arising that I could not control. I had to sell my house and live in a rented one, which was not ideal. Luckily the owner was sympathetic to dogs and accepted Chelsea. She was good in that she didn't wreck the place, which I was grateful for! There was a long, skinny garden at the back and a big park just around the corner, so exercise was never a problem for her. Money was a problem for me though, and eventually push came to a rather rough shove and I felt that the time had come to leave the UK, probably forever. The Continent was the obvious choice as the pet passport system was in place and seemed to be working well. I didn't see a problem in taking Chelsea over to France and there was none. I borrowed my father's big box van and took what I needed to start life abroad. In fact the border control was lenient, to say the least at the Channel Tunnel and in France it was non-existant. The van would be our home until I got on my feet - there was no thought of failure and turning back. Well, we drove all the way down to Spain, as I had always wanted to live in a hot climate, having been brought up in Sydney, Australia as a child - it was in my blood, which was probably why I found it so easy to turn my back on rainy, cold England! To cut a long story short, I eventually found the perfect place for us to live - on the side of a mountain just 20km north of Malaga. It was perfect, except life was going to be hard - no water or electricity, come to think of it, no house either. Another of my "always wanted to do" list was to build my own house and here was the golden opportunity. To begin with, I rented an apartment in the village close by and got a Land Rover to get back and forth to the mountain. In Spring and early Summer it was beautiful up there, very green and covered in wild flowers. Chelsea would run about all over the place - she somehow knew it was going to be our home. 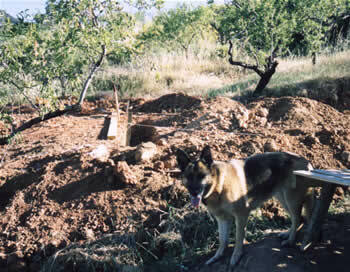 Here's Chelsea on the mountainside in early June 2003. I got some work in the local village helping an estate agent build their website in English! They were after English buyers and it made perfect sense, as well as paying quite well. The owner of that estate agency had a brother who owned the local builders merchants, so I got a load of building material cheap and set about building my own cabin on the side of the mountain. I hired a JCB digger (or backhoe) to make a nice flat area to build the cabin and also to define a flat track to make it a bit easier driving up and down to where I woudl build the cabin. Within a month, the lush green mountainside turned brown as lack of any rain for nearly two months dried and cracked the soil. 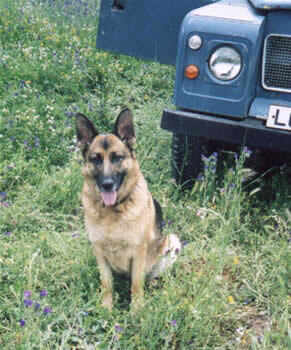 Here's Chelsea on the mountainside in July 2003. The clay that was once soft stuff that stuck to your shovel like treacle changed into something as hard as concrete! And concrete is what I spent the next few weeks mixing and laying single-handedly to make the foundation and slab for the intended building. That was hard work and saw me lose weight from a chubby fourteen stone down to a trim and fit eleven and a half! Chelsea lost a few pounds only, mainly because of all the running around up and down the hill - she loved it up there with so much open space to run. Well, work progressed slowly. The cabin was only small, five meters by eight, and a basic rectangle built from concrete blocks on a concrete base, but I knew what I was doing and created four perfectly straight walls with doorways and window openings, a flat roof and before long Chelsea and I had a permanent home. We scavanged furniture from bins at the side of the road - you'd be amazed at what people throw out here, some of the stuff was almost brand new! I brought up water from the village and had a generator for electricity, which I connected up to a bank of batteries which charged when I ran it, then used them with 12 volt lights at night to sit quietly and read. In the evenings I would sit outside and watch the sun go down over the mountains in the west and Chelsea would run over to the ridge on the other side of a mini shallow valley where the track had been cut to play with a family of foxes. Sometimes it got fully dark before she'd come back and we'd settle down for the night.